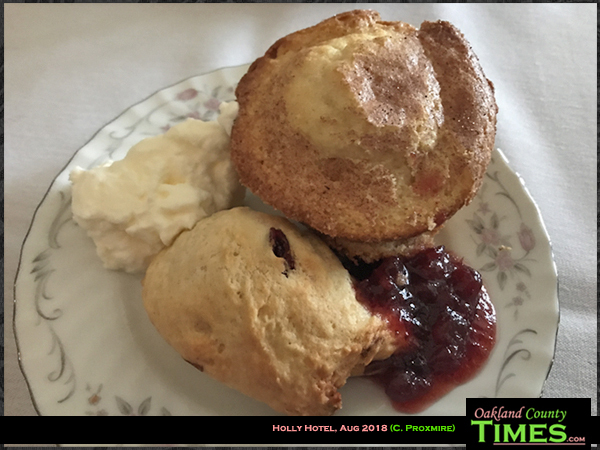 Holly, MI- At a recent visit to the Holly Hotel for the Queen Ann Luncheon Tea, a friend and I both had the same thing, the signature Chicken Strudel. 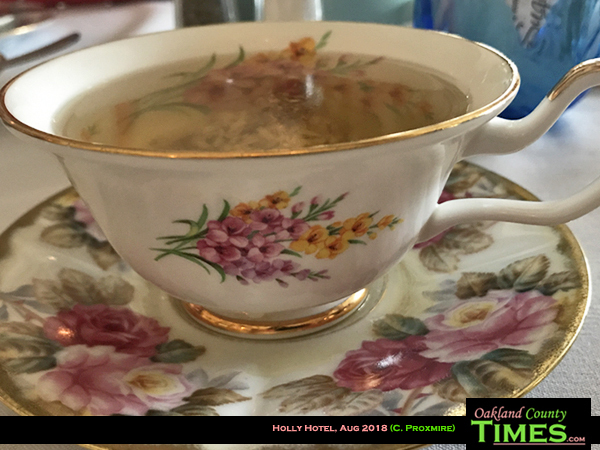 The experience of the afternoon tea is about more than just the food, although that is, of course, delicious. To begin with you’re in this historic Victorian setting surrounded by antiques and flowery décor. Candles and unique china patterns add to the back-in-time feel, as does the attentive service as the meal is served in courses. The tea is a big part of the experience, with a list of fine teas that are ripe with flavor and unique combinations. I opted for the “North Tea” which is made with coconut, cardamom, cinnamon, ginger, licorice and pink peppercorn. My friend absolutely loved her “Black and Gold Tea,” which had “chocolaty notes of the Yunnah harvest.” Neither of us really knew what that meant, but we felt pretty fancy sipping at our choices. 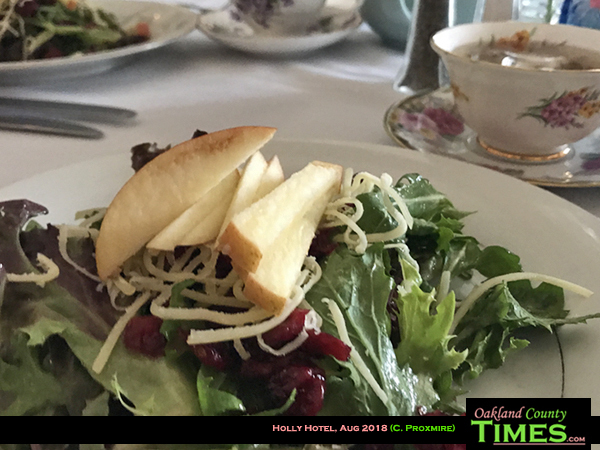 The first course was an apple cranberry salad that was delicious. And then came the strudel. 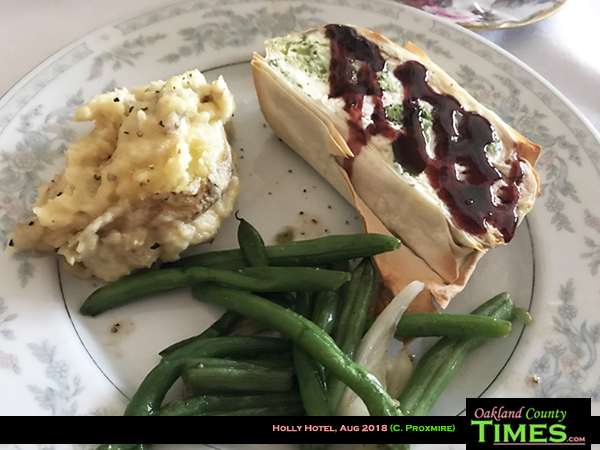 This is the Holly Hotel’s signature dish – made with organic chicken, broccoli, euro cream, and french cheese wrapped in filo and topped with raspberry coulis. There were other good choices too. I’ve previously written about their tenderloin, and the beef wellington. There is always a vegetarian option, and other choices vary but could include fish, duck or other special dishes. Lastly we were presented with desert – a muffin, a scone, Crème fraiche, and fresh fruit preserve. It was a delightful meal in a truly beautiful place. Holly Hotel, which is a sponsor of Oakland County Times, is located at 110 Battle Alley in Downtown Holly. Check out their website: www.hollyhotel.com.